domains.co.za offers fast, reliable and secure web hosting. Your website deserves the best web hosting in South Africa from one of the leading web hosting companies in South Africa. domains.co.za have been in business since 2001 and have become trusted and renowned for providing the best web hosting in South Africa. Our web hosting is done in carrier grade Supermicro hardware and utilizes Intel Xeon E5 processors and Super Fast SSD hard drives in raid 1. We are so confident in our web hosting that we offer all customers a 60 day money back guarantee. Our entire web hosting environment is backed up and archived on a weekly basis. This ensures that should any problem occur on your website, we can simply roll it back to a previous working version. 1-Click Installs make installing applications like Wordpress, Joomla, Drupal and many more effortless. There are over 260 applications which can easily be installed in a click of a mouse. Wordpress is a state-of-the-art publishing platform with a focus on aesthetics, web standards and usability. WHMCS handles everything from signup to termination, with automated billing, provisioning and management. AbanteCart is a free PHP based e-Commerce solution for merchants. Concrete5 makes running a website easy. Go to any page in your site, and a editing toolbar gives you all the controls you need to update your website. CMS Made Simple provides a fast and easy way to create a professional web site and manage its content. e107 is a content management system written in PHP and using the popular open source MySQL database system for content storage. Serendipity is a PHP-powered weblog application which gives the user an easy way to maintain an online diary. Dotclear is an open-source web publishing software created in 2002 by Olivier Meunier. A one man's project at first. b2evolution is an advanced weblog tool, allowing you to run your own blogs, newsfeeds or even photo stream. Textpattern is a web application designed to help overcome the hurdles to publishing online. Ghost is an Open Source application which allows you to write and publish your own blog. Nibbleblog Easy, fast and free CMS Blog The database used is based on XML files. AEF - Advanced Electron Forum is a free bulletin board software written in PHP and MySQL. It has a lot of unique features and is very fast. Gallery is an open source web based photo album organizer. Gallery gives you an intuitive way to blend photo management seamlessly. Zenphoto is a CMS for selfhosted, gallery focused websites. Our focus lies on being easy to use and having all the features there when you need them. TinyWebGallery is a free php based photo album / gallery that is very easy to install, extremely user friendly, does not need a database (uses xml files). phpAlbum is an Open Source PHP script which allows you to create your personal Photo Album / Gallery in just a seconds. All you need is a web space with FTP access. 4images is as a web based PHP and MySQL for displaying images on the Internet. 4images can be configured through an administration area. PmWiki is a wiki-based system for collaborative creation and maintenance of websites. PmWiki pages look and act like normal web pages, except they have an "Edit" link. Magento is an Open Source e-Commerce web application, building on components of the Zend Framework. CubeCart is a complete e-Commerce shopping cart software solution. Loaded 7 is a responsive e-Commerce web application. Based on a 3rd generation e-commerce platform. Which Web Hosting package is right for me? 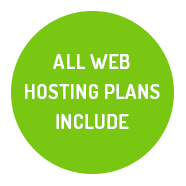 If you are a home user wanting a personal website, then Budget Hosting Plan should be suitable for your needs. If you are a small business looking to host your company website with email addresses, the Value or Pro Hosting Plans should be suitable for your business needs. If you are looking to host directories, e-commerce websites or forums, then the Pro or Expert plans should be suitable for your needs. What's included with my Website Hosting Package? The Website Hosting Package will give you everything you need to host your personal or company website. The packages include a free .co.za domain which will help you secure your presence online. domains.co.za is proud to offer our Web Hosting customers the services of our exceptional, customer support staff. Our team is highly trained, friendly and dedicated to your success. We offer a knowledgebase with useful tutorials and videos that will assist you with all aspects of hosting your website. What is 1-Click Easy Installs? 1-Click Installs make installing applications like Wordpress, Joomla, Drupal and many more effortless. There are over 300 applications which can easily be installed in a click of a mouse. What SSL do I get for R25/month? You can add Certum SSL to your website to secure your customers browsing of your website for only R25 per month. Give your customers peace of mind and give your website a Google Ranking Boost by adding an SSL to it. SSD's (Solid State Drives) are the next generation of hard drives which have no moving parts, utilize less power, and are up to 500% faster than a traditional hard drives. We use them to ensure your website runs lightening fast. On termination, or expiry, of your account and / or the CodeGuard backup solution, you will no longer have the right to continue to use the Software and / or the Services. Please note that you will no longer be able to access and restore your backup data either. Should you fail to pay / renew your monthly invoice / subscription, CodeGuard may terminate your account and delete all backups within your profile immediately and without notice. As CodeGuard is a Licensed Service from a 3rd Party Provider, NO refunds can be issued once the product has been purchased. You agree to pay the fixed subscription fees for the account type you have selected, as well as agreeing to any applicable restrictions thereof, including quotas on the amount of storage and / or databases you are allowed to use. If you exceed any quota allocated to your account, you hereby agree that CodeGuard may restrict your ability to backup further data until you have reduced your storage usage, or upgraded to a larger CodeGuard account with a higher disk space quota. You may cancel your subscription PRIOR to the next billing date to avoid future charges and your CodeGuard service will continue until the end of the current billing period. Please note that NO service fees will be refunded. You are responsible for keeping your passwords secure, and you agree not to disclose your passwords to any third party. You are solely responsible for any activity that occurs under your Usernames and Accounts, including any and all Sub-accounts. Even though CodeGuard backups are performed automatically, you are required to / responsible for logging in and managing your backups, performing tests and test restores, thus ensuring that your backups are performed correctly and in their entirety.